Piraeus – ΑΤΤΙΚΟ ΜΕΤΡΟ Α.Ε. On November 21st 2008 ATTIKO METRO S.A. proceeded to the re-procurement of the project related to Line 3 Metro extension to the Western Suburbs, terminating in the area of Piraeus (underground tunnel, 7.6 km long, with 6 modern stations: Aghia Varvara, Korydallos, Nikaia, Maniatika, Piraeus, Dimotiko Theatro). On February 13th 2009, 6 technical consortia/joint ventures expressed their interest in the construction of the project. On October 5th 2011, ATTIKO METRO S.A. proceeded to the unsealing of the Financial Offers for the Project concerning the extension of Metro Line 3 to Piraeus. Based on the aforementioned Tender results, J&P – ΑVΑX S.A. – GHELLA SPA – ALSTOM TRANSPORT SA is the lowest-bidder of the Tender. On March 1st 2012, the relevant contract was signed with the contracting joint venture J&P – AVAX S.A., GHELLA SPA, ALSTROM TRANSPORT S.A for the construction of Line 3 extension from Aghia Marina to Piraeus, 7.6 km long in total, with 6 modern Metro Stations. Attiko Metro S.A. was represented by Mr. Christos Tsitouras, Chairman of the BoD and Managing Director, while the Construction Joint Venture J&P ΑVAX SA was represented by Mr. Konstantinos Mitzalis, Managing Director. The extension of the Tramway from Neo Faliro to Piraeus centre recently commenced, completing, thus, the direct connection of the coastal axis with Piraeus through the Tramway network. More specifically, in January 2013 the contract was signed between ATTIKO METRO S.A. and the Company THEMELI S.A.
Extension of the Tramway network from Neo Faliro to Piraeus centre, completing, thus, the direct connection of the coastal axis with Piraeus through the Tramway. The construction of this specific project commenced in September 2013 by ATTIKO METRO. Conversion of Line 1 (ISAP) section form N.Faliro to Piraeus into an underground structure, with the addition of one new station in the area of Keranis Factory, unifying, in terms of functions and town planning the areas of Piraeus currently served by the surface ISAP Line 1. The designs pertaining to this Project are about to be completed enabling, thus, ATTIKO METRO S.A. to put it to Tender. Extension to the Tramway Network to Keratsini – Perama, following an underground alignment at a large part of Keratsini Municipality, running along the alignment of the old Perama tramway. The Advanced Concept Designs regarding this Project are underway. Maniatika Etolikou & Mavromihali Str. 6,5km of the tunnel of the extension will be constructed using the Tunnel Boring Machine, while the remaining parts at the beginning and at the end of the project will be constructed via the underground excavation method. 8 ventilation shafts in total shall be constructed along the new Line and two shafts for the TBM’s entering/exiting. – TBM access shaft: The installation of an indoor steel plate has been completed. – Komninou shaft: Surface reinstatement is in progress. – Megalou Alexandrou shaft: Surface reinstatement is in progress. – Pissidias shaft: The final lining of Pissidias Shaft has been completed, screed placing at the treads of the escape staircase is in progress. NIKEA station: The painting works of the Station’s ventilation – blast shaft at the point where the TBM departs the station are in progress. 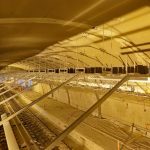 MANIATIKA station: Main tunnel of the station (NATM): The construction of platforms and works for filling the station with non–reinforced concrete is in progress. Underground NATM sections of the station: The works for the excavation – temporary retaining of the staircase galleries and the west lift have been completed. North Ventilation Shaft of the Station (Dimitrakopoulou Street): The permanent lining of the vault-walls of the connecting gallery has been completed, while the permanent lining of the shaft walls are in progress. PIRAEUS station: The works for the assembly of the building crane in the area of access 3 is in progress. DIMOTIKO THEATRO station: At the Main Station, at Aghiou Konstantinou square, the painting works of industrial floors at the mechanical floor level are on hold, while masonry works at the E/M & Concourse levels and at the platform level are in progress. The concreting of the perimeter walls at the junction with the the TBM tunnel (axis 19, platforms up to the concourse level) is in progress. Staircase galleries, South Staircase: Vault grouting works are in progress. Entrance on Korai Square: Secondary concreting works are in progress. Dimotiko Theatro Ventilation Shaft: Concreting works for the foundation of the permanent lining are in progress. Rallios Shaft Ventilation Gallery: Works for the concreting of the foundation of the permanent lining are in progress. Deligianni shaft: Works for the waterproofing of perimeter walls are on hold. TBM access shaft: The construction of slabs at levels +47.46 and +56.11 has been completed, while the surface reinstatement is in progress. Komninou shaft: The installation of a grid at street level has been completed, while the architectural works (manufacturing of balustrades) are in progress. AGHIA VARVARA station: The cladding of walls and columns, as well as the reinstatement at street – square level (0) are in progress. – Megalou Alexandrou shaft: The works for the installation of a grid at street level have been completed, while the architectural works (manufacturing of balustrades) are in progress. KORYDALLOS station: The installation of false ceilings is in progress. – Pissidias shaft: The final cladding of the central wall and of the staircase of the main Shaft is in progress. NIKEA station: The painting works (Phase B’) of the Station’s technical rooms, as well as the preliminary works for the installation of the false ceiling metal panels on the roofs of the Station’s levels -3 and -4 are in progress. MANIATIKA station: At the Station’s C/C, the permanent lining of staircase S4 has been completed, while the works for the permanent lining of the mezzanine floor slab are in progress. – Main tunnel of the station: The works for the permanent cladding of the north headwall, as well as the dismantling of the temporary concrete in the deepening area are in progress. – Underground NATM sections of the station: The permanent lining of the SE, the NW and the NE access tunnel is in progress. – Mela shaft: The worksite fencing related works are in progress. PIRAEUS station: The works for the installation and pre-stressing of struts at the 5th level are in progress. – Roloi shaft: The construction of the foundation has been completed, while the concreting of the permanent lining of the perimeter walls is in progress. DIMOTIKO THEATRO station: At the Main Station, at Aghiou Konstantinou square, the masonry works at the E/M & Concourse levels, as well as the painting works of industrial floors at the mechanical floor level are in progress. The installation of reinforcement at the perimeter walls located in the connecting area with the TBM tunnel is in progress. – Staircase galleries: At the South Staircase, the works for the installation of secondary concrete are in progress. – Entrance of Korai square: Works for the waterproofing and concreting of the permanent lining are in progress. – Double track TBM Tunnel, in Electrical Recess 3RP3 KP 8+707.585: The concreting of the permanent lining (2/14m) is still pending, while the excavation – temporary retaining (progress/phase A’ 8/14, phase B’ 2/14) is in progress. – Deligianni shaft: Works for the waterproofing of perimeter walls are in progress. Panepistimio shaft: The concreting of the permanent lining is on hold (the pumping station flooring is completed).